These are developmentally primitive variety of neurons with single process which is the axon. It is devoid of any dendrites. These are the fusiform or spindle-shaped neurons with one dendrite and one axon arising from opposite poles. These are specialized neurons found in the pathways of special senses, e.g. Retina (visual pathway), nasal epithelium (olfactory pathway) and in the vestibulocochlear nerve (auditory pathway for hearing and equilibrium). These are neurons with round or oval shape with a common short stem of process dividing into peripheral (dendrite) and central (axon) limbs. 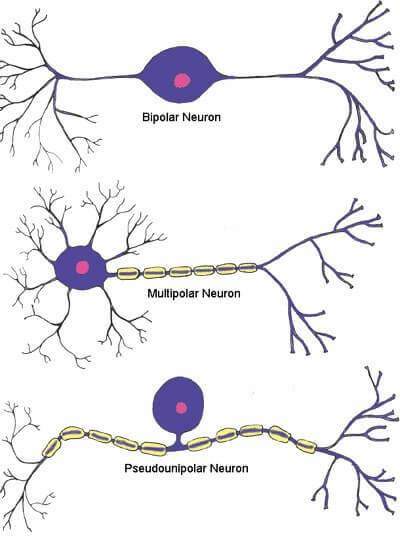 These neurons are called pseudounipolar because apparently they seem to have two poles. Classical example of these are the dorsal root ganglion cells of spinal nerve lying just outside and close to the spinal cord carrying sensory impulse from periphery towards the spinal cord. These neurons present single axon with multiple dendrites. Their shape will vary from triangular or pyramidal to polygonal depending upon numbersof dendrites so also the polarity. For example, the neurons of motor area of cerebral cortex are pyramidal or triangular whereas the motor neurons of spinal cord are polygonal and neurons of cerebellum are flask-shaped.